3 bedroom, 2 bathroom pet-friendly home with private pool in secluded Inlet Bch. Your SAFE RETREAT! All amenities! Perfect family gathering place! Notify your family, grab your spouse, significant other, your kids, your grandkids, dog/s and plan to COME !! .. no pet fee for returnees! .. after 4 visits, $1000 discount on 5th visit!) .. CALL/EMAIL .. private pool .. too good a deal to miss! The weather is BEAUTIFUL .. BIRDS, BUTTERFLIES and BEACH! .. FABULOUS FISHING & FOOD! .. .. what more could you ask for? PERFECT HOME FOR FAMILY GATHERINGS & MINI-VACATION/EXPLORE THE DELIGHTS OF 30A and THE BEACHES of SOUTH WALTON .. or RETREAT and just relax! BEAUTIFUL 14' x 28' POOL at back door!!! and only 200 yds to PET-FRIENDLY BEACH! BEACH SERVICE available $150 per week; Sea Oats Beach Service provides daily set up of 2 chairs/table/umbrella to save your daily lugging/removal of your/our 'stuff'. 'THE LAST RESORT', our pet-friendly accommodation on 1 1/4 acres, sits on top of the dunes, overlooking the squeaky white sand and crystal waters of secluded Inlet Beach, pristine Camp Helen State Park to your left, and the world famous architecture of Rosemary Beach and Seaside to your right. Our dream home offers 92' of deck, (half of which is screened), a 24'x24'x5' secure kennel with animal access to upstairs, an unbelievable view, quick beach access (when toting beach gear, we recommend the Inlet Beach carpark/walkover with toilets, showers & lifeguards, 200 yds west, approached from our rear driveway) ... or walk the woodland sand trail down to the beach .. a local Beach Service (2 chairs/table/umbrella) is available for $150 per week, $25 per day, to save on your toting /removing these items daily .. believe me, well worth it! This is PARADISE ...peace and quiet .. but the excitement and amenities of Panama City Beach start just five minutes away. This 3 bedroom home has 2 Queen beds, 1 Q. sofabed, Bunks (double down,single up), single trundle & 1 youth bed (or crib), is comfortable and well equipped: 3 TV's, 3 DVD's, library, games corner, deck swing, hammock, extra covers for the sofas if your dogs prefer people furniture (as ours do). We are proud to offer 'The Last Resort' on this vacation site. 'THE LAST RESORT' owners, Susan & Donal Alfieri, enjoy a beach moment on the dunes of pristine Inlet Beach. We purchased this acre lot in the early seventies, designed the home we would build atop the dunes, viewing the coastline for miles, and eventually built it in 2000. 'THE LAST RESORT' would be our pet-friendly rental paradise and folks could come on vacation with their dogs. Now Mr. Alfieri & I not only stay here, but LIVE here on E Park Place Ave. In 2003, after completing the beautiful private pool the previous year, we built our primary residence, 'BILLABONG', next door, so we are able to give 'on-the-spot' management. You may chose to rent Beach Service, also $150 for the week, 2 chairs, table and umbrella, to save your lugging/retrieving our/your beach stuff each day! 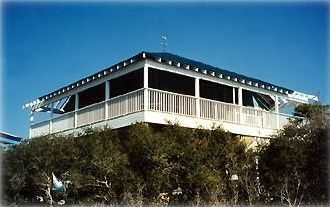 92'x 10' deck, half screened, furnished with picnic table, chaises, swing, hammock, etc. art galleries, fabulous restaurants, wine tastings, Songwriters' Festival in January, Artquest in May, bird watching, just relaxing and enjoying the view!